On a stunning campus in one of the most exciting and progressive cities anywhere, the next generation of global thinkers gathers to discard conventional thinking, civic complacency, and outmoded preconceptions. Leaders, visionaries, and problem-solvers, we come together to explore new ways of knowing through classic liberal learning and innovative collaboration. 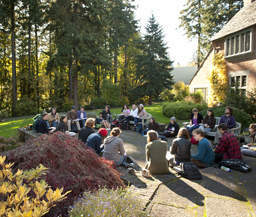 At Lewis & Clark College in Portland, Oregon, we welcome all who are alive to inquiry, open to diversity, and eager to shape the new global century. Through our undergraduate programs in the arts, humanities, and sciences, and through our graduate and professional studies in education, counseling, and law, we undertake original research, interdisciplinary studies, and community service. We push beyond what is known in order to discover something new every day. Reflecting the College's national and global reach, approximately 90 percent of Lewis & Clark's 2,011 undergraduate students come from outside Oregon, representing 47 states plus the District of Columbia and 55 countries. 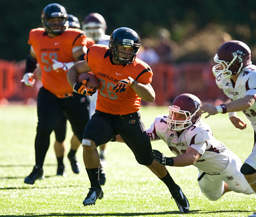 Commitment to academic excellence and personal and intellectual growth is imperative for successful Lewis & Clark applicants. Lewis & Clark is very selective, and every part of the application matters: academic records, essays, involvement in activities at school and in the community, leadership, and the strength of recommendations. Students are encouraged to visit our campus. Interviews are available but not required. The best-prepared applicants will have had four years of English, four years of mathematics, three to four years of history or social sciences, three years of laboratory sciences, two to three years of a foreign language, and one year of fine arts. Required credentials include the Common Application with essay and supplemental questions, an official transcript including first term grades from senior year, the school report form, and one academic teacher recommendation. Lewis & Clark requires the SAT or ACT, unless the student is applying via the Test-Optional Portfolio Path (see lclark.edu for details). There is no application fee. Deadlines for first-year applicants are: November 1 for binding Early Decision (notification, December 15), November 1 for non-binding Early Action (notification, January 1), and January 15 for Regular Decision (notification, April 1). Transfer applicants are reviewed on a rolling basis beginning January 1. Mastery of the fundamental techniques of intellectual inquiry: effective writing and speaking, active reading, and critical and imaginative thinking. Exposure to the major assumptions, knowledge, and approaches in the fine arts, humanities, natural sciences and social sciences. Critical understanding of important contemporary and historical issues. Awareness of international and cross-cultural issues and gender relations. Application of theory and knowledge to the search for informed, thoughtful and responsible solutions to important human problems. The curriculum combines structure and freedom. Depth and breadth of subject matter are highly valued, but equally important are creativity and critical thinking. There are many opportunities for students to take their learning to a higher level, such as honors projects within academic departments, independent research, and internships. Our fast-growing Bates Center for Entrepreneurship and Leadership offers academic and cocurricular opportunities to translate knowledge and experiences into skills for success beyond college. Two 15-week semesters make up the academic year, and each semester students normally take four 4-semester-credit courses, and one or more activity courses. The average student course load is 16 credits per semester. The requirement for graduation is 128 semester credits, approximately eight classes each year. 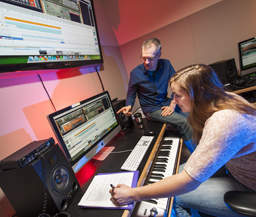 Lewis & Clark offers one degree: the Bachelor of Arts. Students have a wide selection of majors from which to choose: art (studio), art history, Asian studies, biochemistry and molecular biology, biology, chemistry, classics, computer science, computer science and mathematics, economics, English, environmental studies, French, German, Hispanic studies, history, international affairs, mathematics, music, philosophy, physics, political science, psychology, religious studies, rhetoric and media studies, sociology/anthropology, theater, and world languages and literature. Students may also design their own major, pursue a double major, or select from 28 minors. Pre-professional preparation is available in the fields of law, business, education, entrepreneurship, and medicine. Dual degree (3-2 or 4-2) programs in engineering are offered in cooperation with Columbia University, Washington University in St. Louis, and the University of Southern California. A dual degree, B.A/M.B.A. program is available in conjunction with the Simon Graduate School of Business at the University of Rochester. 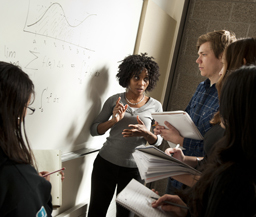 A dual degree, 4-1 B.A/M.A.T program is offered through Lewis & Clark's Graduate School of Education and Counseling. In addition, there is a guaranteed admission agreement with Lewis & Clark's Law School for students meeting certain criteria. 2019-20 tuition and fees are $52,780, and room and board are $13,008. During the 2017-18 academic year, approximately 90 percent of Lewis & Clark students received some form of financial assistance. Institutional, state, and federal resources including grants, loans and work-study may be part of an aid package. Eligibility for need-based funds is based primarily on an analysis of the income and asset information submitted on the Free Application for Federal Student Aid (FAFSA) and the College Board's CSS/Financial Aid Profile. To receive priority consideration for all sources of need-based financial aid, students must meet appropriate deadlines for admission and should submit the FAFSA and Profile by the date appropriate for their admissions plan as noted at go.lclark.edu/fao. 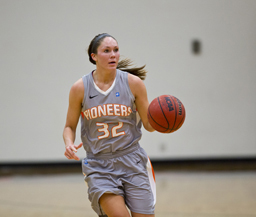 With 120 student-run organizations, there's never a lack of things to do at Lewis & Clark. Cultural events include lectures, symposia, art exhibits, plays, musical events, and dance performances. Athletics play an important role on campus, where 19 varsity teams, 9 club teams, and numerous intramural sports keep students physically active. Nature-lovers will enjoy the College Outdoors program, which offers activities such as hiking, backpacking, rafting, skiing, and kayaking in the wilderness of the Pacific Northwest. There are also plenty of opportunities for volunteering in and around the Portland area. Lewis & Clark is committed to residential education, to creating a community dedicated to the exploration of ideas, values, beliefs and backgrounds, to the discovery of lifelong friendships; and to collaboration, both formal and informal, with peers, faculty, and staff. 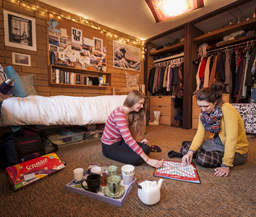 About 69 percent of undergraduates live on campus in residence halls; most of our residential space is co-ed. Along with personal living space (usually shared by two to four students), the residence halls host several community venues including coffee houses, convenience stores, art centers, outdoor basketball courts, recreation and fitness centers, lounges, and game rooms. Themed communities within the residence halls are also available, including those that focus on visual and performing arts, multicultural engagement, outdoor pursuits, environmental action, holistic wellness, and more. There is no Greek system at Lewis & Clark. 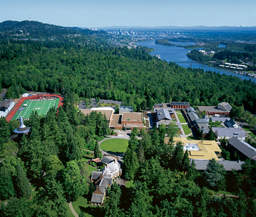 Founded in 1867, Lewis & Clark College moved to its present location in Portland's southwest hills in 1942. The 137-acre campus sits on a wooded hilltop just six miles from Portland's dynamic downtown, offering stunning views of snow-covered Mount Hood. Portland is a very livable city with an excellent public transportation system that includes buses, light-rail, and the Portland streetcar. In addition, a free Lewis & Clark shuttle runs frequently into the heart of the city and back to campus. The scenic Willamette River bisects metropolitan Portland, which is home to approximately 2.4 million people. There are endless things to do in Portland: 10,477 acres of parks; diverse galleries, museums, music groups, and theater and dance companies; and a nationally recognized food scene. The city also offers professional hockey, soccer, and the NBA's Portland Trail Blazers. Our students take advantage of the many internship and service opportunities available in the Portland metro area. Just 50 miles east of campus rises Mount Hood with its 10-month-a-year skiing and snow-boarding. The rugged Oregon coastline is just 90 miles to the west. Throughout the state lie innumerable hiking, climbing, and backpacking opportunities. 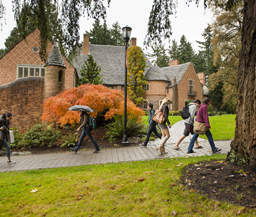 Located on Palatine Hill on a former estate, Lewis & Clark offers students a campus of unmatched physical beauty, along with academic and residential buildings designed to support a rigorous academic environment and strong sense of community. Academic buildings include the Aubrey R. Watzek library, which is open 24 hours on weekdays during the school year and houses over 770,000 items including books, documents, audiovisual materials, microforms, and periodicals. The library is a member of the Summit consortium, allowing access to approximately 28 million items from the 39 member institutions in the Pacific Northwest. Watzek library also houses the most extensive collection of printed materials known to exist on the Lewis and Clark Expedition. Evans Music Center includes a 410-seat recital hall equipped with an orchestra pit and stage elevator, 22 practice rooms, 43 pianos, 2 harpsichords, a Javanese gamelan, a Baroque organ, and an electronic music studio with digitally-based music production capability. An 85-rank Casavant organ is housed in the college chapel. Fir Acres Theatre houses a 225-seat Main Stage performance/teaching theatre and a black-box experimental theatre (also used as dance studio) along with a scene shop, costume room, green room and design lab. The Olin Center (physics and chemistry), the Biology-Psychology building, and BoDine (mathematical sciences) all house well-equipped classrooms and extensive laboratory spaces for our natural sciences. Our notable science facilities include a scanning electron microscope, a time-lapse deconvolution microscope, a gas chromatograph/mass spectrometer, a high-pressure liquid chromatograph, a 300 MHz nuclear magnetic resonance spectrometer, an observatory with Newtonian and solar telescopes, an astrophysics lab, an electrical instrumentation lab, a molecular modeling lab, a lab for studying the biomechanics of animal locomotion, and a lab for studying parallel computing. Nearby Tryon Creek State Park and the Columbia River Gorge are frequently used as laboratories for field courses in biology and geology. 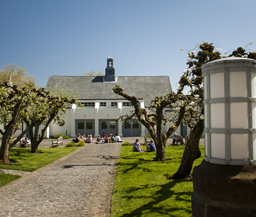 Other academic buildings include the Fields Center, which houses studio facilities for drawing, painting, sculpture, ceramics, graphic design, and photography. The Miller Center and Howard Hall are home to the humanities and social sciences and offer state-of-the-art classrooms, small auditoriums, and the Keck Interactive Learning Center, a digital language lab. Several computer labs are available for student use. These labs house more than 130 computers, along with peripherals such as scanners, laser printers, and digital video editing equipment. Other equipment including digital still and video cameras, digital audio recorders, and more are available for checkout. All residence halls have wireless capability. The institution has a 1000 Mbps connection to the internet. Overseas and off-campus study programs have been a big part of Lewis & Clark for more than 50 years. 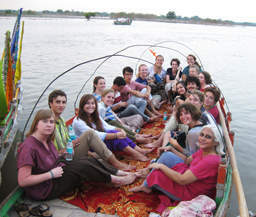 Each year, about 300 students participate in approximately 30 programs abroad and in selected areas of the United States. During the next few years, programs will be offered in Australia, Chile, China, Cuba, Dominican Republic, East Africa, Ecuador, England, France, Germany, Greece, India, Ireland, Italy, Japan, Mexico, Morocco, New York City, New Zealand, Russia, Senegal, South Korea, Southeast Asia, Spain, Taiwan, and Washington, D.C. Whether their off-campus study is domestic or abroad, students earn credit (equivalent to a full semester or year) for their academic work. Depending on the specific program content, it is possible to earn General Education and/or major credit during these programs. 60% of students participate in one of these programs prior to graduating from Lewis & Clark. Students can use Lewis & Clark's financial aid and scholarships for assistance in these programs. Full battery of diagnostic psycho-educational assessments with recommendation for accommodation. Psycho-educational assessment or verification of diagnosis with recommendation for accommodation. 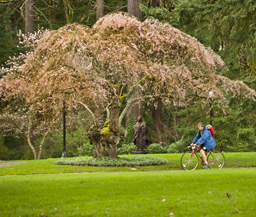 Located in one of the world’s greenest cities, Portland, Oregon, Lewis & Clark College is eagerly doing its part to keep the city sustainable. Lewis & Clark requires all new buildings to achieve LEED Gold, and a whopping 100 percent of the school’s electricity is generated by “green power” sources! Portland’s 2009 Climate Action Plan sought a 20 percent reduction in greenhouse gas emissions by 2018, yet Lewis & Clark has already exceeded that goal by reducing emissions over 30 percent since 2006. 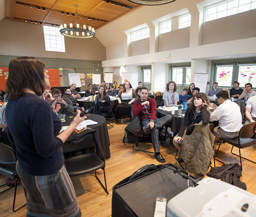 Lewis & Clark’s location in the green mecca of Portland provides students with an abundance of opportunities to work with and learn from environmentally conscious organizations off campus. 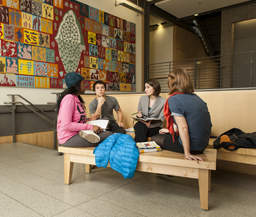 On campus, students can join groups such as SEED (Students Engaged in Eco- Defense), the Sustainability Council, and SABER (Student Advocates for Business and Environmental Responsibility). About a quarter of the food served on campus is grown within 100 miles of the school. The city of Portland has long been a trail-blazer—literally— in bike transportation, having over 150 miles of bike lanes. Lewis & Clark works to help students utilize this healthy and environmentally friendly mode of transportation. The student bike sharing program was recently funded by the school’s “Green Fee Fund,” giving student body access to bikes, safety gear, and training. In addition, the college has started installing bike repair stations around campus for when students need a quick bolt tightening or tire pump. The school’s latest construction, the LEED-certified Holmes Hall, also has a free electric vehicle charging station. 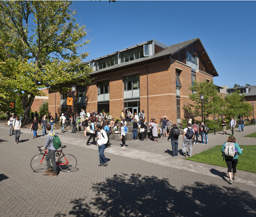 In 2013, the college was recognized for its efforts by being ranked first in the Northwest Conference in the EPA’s College and University Green Power Challenge. You should also visit the Hoffman Art Gallery, Evan Williams Memorial Tree Walk, and JR Howard Hall (most recent example of our commitment to sustainable building practices). Downtown Portland- so much to see and do! Be sure to plan time for lunch at one of Portland's food carts. The Portland International Airport is approximately 20 miles from campus. Tri-Met (public transportation) taxis and ride share options are available for transportation to campus from the airport. Amtrak trains and Greyhound/Trailways buses serve Portland. From I-5, exit to Terwilliger Blvd. Follow Terwilliger south and east to campus (toward Tryon Creek State Park). The admissions office is in Frank Manor House. Lewis and Clark is 6 miles south of Portland city center, in the southwest section of the city. There are a variety of hotels and bed and breakfast options throughout the city and surrounding area.